ITIL 4 enables IT teams to continue their vital role in modern business strategy. 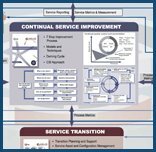 It expands on previous versions, supporting existing investments in ITIL, and provides a full-service digital operating model for delivering and operating tech-enabled products and services. This means it supports emerging technologies, such as robotics and AI, by offering more practical and flexible support as technologies develop. Whilst retaining all the best bits from the previous version, ITIL 4 will place a much greater emphasis on working holistically, when it comes to delivering products and services, and on the importance of working collaboratively. What does this mean for ITIL V3? To find out how to transition to ITIL 4 if you're at the Intermediate or Practitioner level, or are a qualified ITIL Expert, take a look at our ITIL syllabus changes page. If you require training for more than one person, please contact a training consultant directly using the number at the top of this page or email contactus@ilxgroup.com.